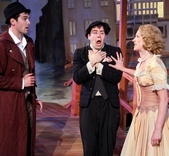 (l to r) Matthew Simpson as Antipholes of Syracuse, Jack Moran as Dromio of Syracuse and Amanda Duffy as Adriana. Actors who perform al fresco know how to cope (often amusingly) with the roar of the occasional low-flying plane. But on the opening night of the Shakespeare Theatre of New Jersey�s production of The Comedy of Errors, the actors performing in the amphitheater at the College of St. Elizabeth encountered an even more disruptive situation. An explosion of Fourth of July fireworks erupted in a neighboring town and lit up the night sky at the beginning of Act II. Notwithstanding the increase of sharp crackles and sonic booms, the otherwise dazzling display could not help but become an extended distraction for the actors, as well as it seemed calculated to capture the attention of the audience. What were the actors to do, not only those caught mid-speech, but also those caught off guard in the midst of those frenetic antics that define this farce. Don�t think for a moment that this prevented this fine company of farceurs from taking ownership of their predicament and allowing it to become part of the ensuing fun. The company cleverly proceeded to embrace this noisy and colorful intrusion and take full advantage of every opportunity to make it fit into the plot as well as serve their character�s personal agenda. Who would have thought that Antipholus of Ephesus�s wonderfully timed line (following a particularly loud blast) — �Some blessed power deliver us from hence� � would ever provoke such a huge laugh. Even more unexpectedly comical was the opportunity for Phillip Christian who played (among other roles) the town conjurer Pinch to use the heavenly visuals (no credit is due to the otherwise excellent lighting designer Rachel A. Miner for this) as if they were in direct response to his whirling dervish-augmented mission to exorcise the Ephesians. Although audiences attending the show through the 4th of July may also have the pleasure of on-high rocketry, the on-stage activities may be commended without reservation. Except for that painfully dull and protracted (presumably necessary) exposition spoken by Matt Sullivan as the merchant Egeon, family audiences are bound to be entertained by the ensuing silliness that involves his quest to find his son a twin and his slave also a twin who have themselves set out to find their respective twin. Get it? With director Jones� eyes and ears undoubtedly guided by the number of children who will be in attendance, Comedy of Errors keeps the convoluted plot from standing in the way of the contrived fun. Jones� funniest bit of business involves two groups of embattled characters and a stand-alone double door with a life of its own. Also amusing is the black mustached bumbling regiment of Keystone Kops. The costumes designed by Nancy Leary smartly evoke early 20th century fashions. What could be more evocative of the Bard�s earliest work than this morsel of madcap confusion that begins with the arrest of Egeon (Sullivan) and continues to resolve its case of mistaken identities? Much of the joy of this production is seeing how closely the two sets of twins actually resemble each other, as we see them running around the same town each unaware of the other. Philip Mutz is excellent as the increasingly flummoxed Antipholus, the twin who is married to the ever agitated Adriana (Amanda Duffy). As the other Antipholus (of Syracuse), Matthew Simpson understandably effects just a little more frustration as the still unmarried twin. Both, however, take a bit of a backseat to the two Dromios (Sean Hudock and Jack Moran) who, as the twin servants deploy an endearing Chaplin-esque quality. Rocio Mendez is charming as the beautiful courtesan and a very fine Eileen Glenn literally lets her hair down as the Abbess a.k.a. long-missing wife of Egeon and mother of the Antipholus�s (Antipholi ?) I liked Jay Leibowitz as Angelo the goldsmith, but even more so in drag as Nell, the ugly kitchen maid. A disarming Allison Layman took all the amorous shenanigans in stride as Adriana�s sister Luciana who thinks she has fallen in love with her sister�s husband. Taking a cue from Luciana, it is best to simply succumb to all the errors of this comedy. Shakespeare Theatre of New Jersey, The Outdoor Stage/Amphitheatre at the College of St. Elizabeth, 2 Convent Road (off Madison Avenue/Rt. 124) in Morris Township, New Jersey. Tickets: $27 - $33 for adults; tickets for ages 17 and under are $15.